- thin piece of plywood (I used very thin lauan plywood from Lowes, which I had on hand after using the lauan for walls in my laundry room - more to come on that project!). You can also use about 3/4 inch plywood. Make sure it is light, as you'll have to mount it to the wall later. 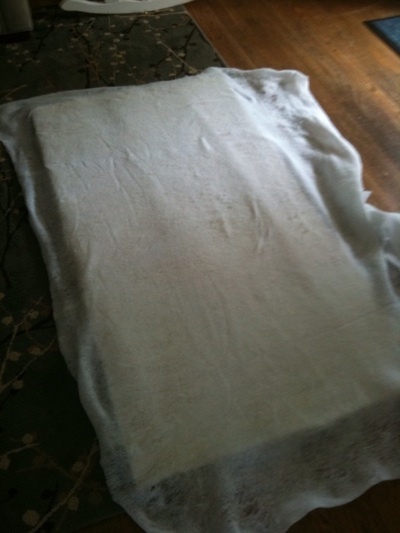 - fabric large enough to cover the entire piece of plywood and about 2 inches extra on each side. You want thick upholstery fabric: something durable. Believe it or not, canvas drop cloths from the painting section of any hardware store work perfectly for this. (1) Measure your bed frame and figure out how wide and how tall you want the headboard. I used some blue painter's tape on the wall to figure out how tall the headboard would be. I just propped up the pillows and saw what height looked good. (2) Cut (or have Lowes or Home Depot) cut your plywood to size. Lauan is so thin I was able to use a sharp razor on it and it was fine. But a jigsaw would have been ideal (hint hint ... Christmas gift anyone?). 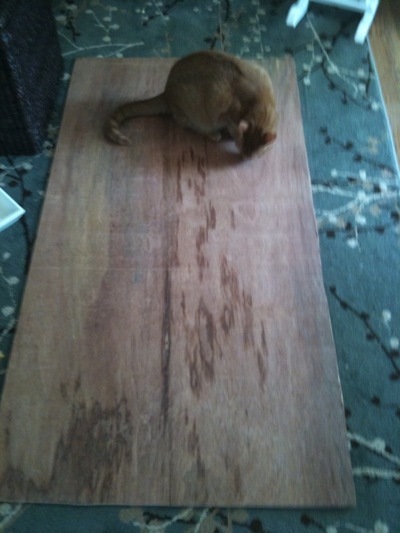 (3) place your plywood on a soft, clean surface. Please forgive my "helper" Coco. (4) cut the foam to the size of your plywood. Lay foam on top of plywood. Then cover the foam with the batting, ensuring there is some overlapping batting on all four sides. (5) Carefully turn the headboard over and staple the batting to the back - just one or two staples on each side to hold it in place will do the trick. Then, flip it back over and take your fabric (which you should iron before you get started) and cover the batting, again making sure that there is extra fabric over all four sides. 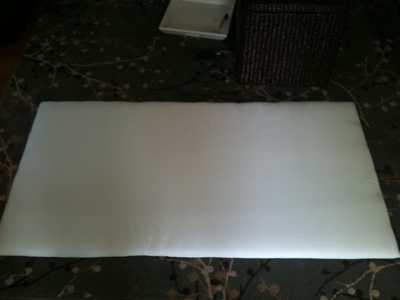 (6) Turn the headboard over again and start stapling. Make sure that you pull the fabric & batting nice and taut before you staple. It is also wise to check your work after every few staples, just to make sure everything looks fine. 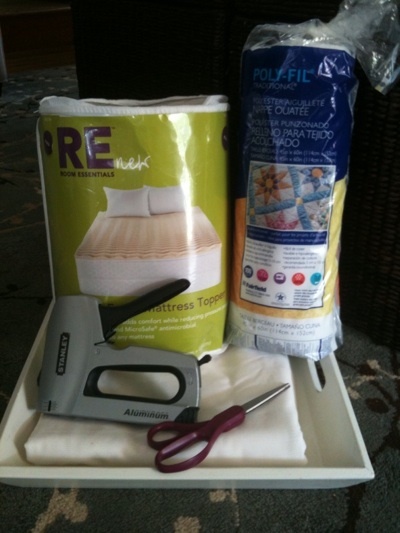 (7) Once all of your staples are in, cut the excess fabric and batting from the back of the headboard and turn it over to admire your hard work. (8) This part is optional: I knew I wanted nail-head trim around my headboard, so I bought this super cool "trim tacks" from this shop on eBay. Basically, it is a reel of nail-head looking trim and you nail in a tack every five spaces or so. It is really easy to use, but I warn you: it is sharp. My fingers look like Edward Scissorhands got a hold of them: I advise working with gloves if you do this. And the best part? It cost me only $19 out of pocket. I had the plywood and fabric on hand. The nail-head trim was $15 (including shipping) and the batting was $4. Foam was free. However, even if you have to purchase plywood and fabric and foam, the total would easily run less than $50. Not bad! I have to say - I'm proud of my work! It's very sturdy and doesn't move an inch. Need any handy-help? Let us know! I have those same lamps at my bedside too! they look terrific with your new headboard. the whole effect is very pretty.